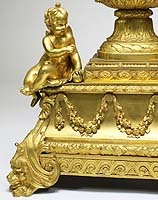 A Very Fine and Palatial French Louis XVI Figural Gilt-Bronze Mantel Clock. The vase shaped case surmounted with a pomegranate-cast finial and flanked by large satyr mask handles fitted with intertwined gilt-bronze snakes, amongst floral wreaths, ribbons and acanthus. 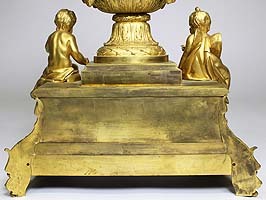 The rectangular acanthus decorated base flanked on each side with a figure of a cherub holding a globe and a Putti writing a poem, both above a plinth decorated with fruit and floral garlands surmounted with lion-mask-legs. 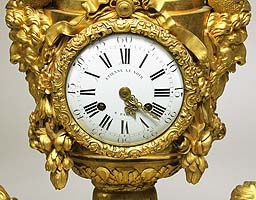 The circular white enamel dial with wreaths of flowers with Roman and Arabic numerals, Signed: Étienne Le Noir, Paris. 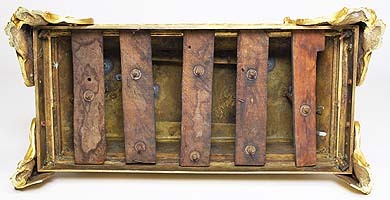 The body stamped "N" numerous times as well as an ureadable faded stamp on the back of the right leg. Circa: Paris, 1780-1790. 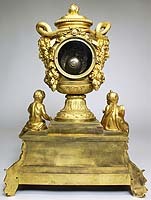 Under the signature Étienne Le Noir à Paris, Étienne Le Noir and his son Pierre-Étienne sold clocks and watches to distributors all over Europe. Their reputation was so great and their products in such high demand. Étienne was born into a great dynasty of Parisian clockmakers; his family was first mentioned in the profession in the 1500s, and the firm established by his father continued to operate until the 1820s. The workshop's production reached its peak during the partnership between Étienne and his son. 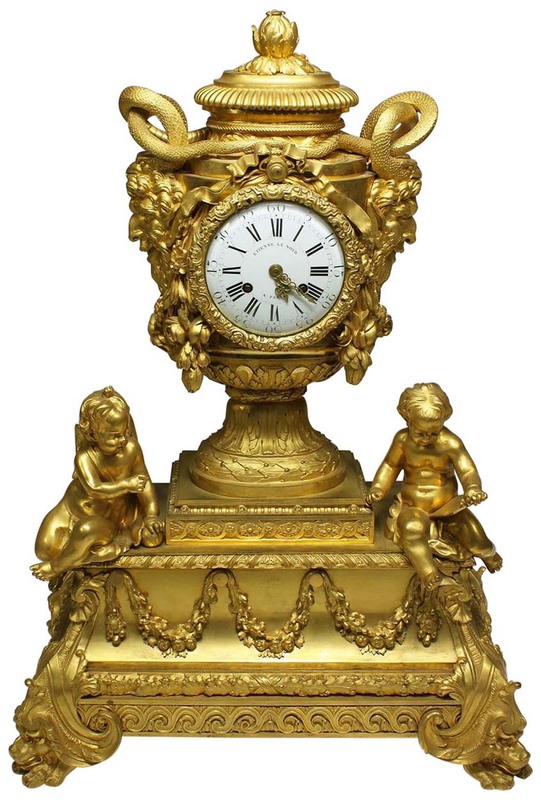 A Very Fine and Palatial French Louis XVI Figural Gilt-Bronze Mantel Clock. The vase shaped case surmounted with a pomegranate-cast finial and flanked by large satyr mask handles fitted with intertwined gilt-bronze snakes, amongst floral wreaths, ribbons and acanthus. 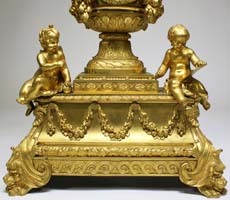 The rectangular acanthus decorated base flanked on each side with a figure of a cherub holding a globe and a Putti writing a poem, both above a plinth decorated with fruit and floral garlands surmounted with lion-mask-legs. The circular white enamel dial with wreaths of flowers with Roman and Arabic numerals, Signed: Étienne Le Noir, Paris. 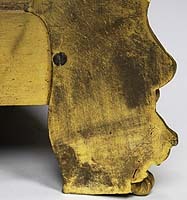 The body stamped "N" numerous times as well as an ureadable faded stamp on the back of the right leg. Circa: Paris, 1780-1790. 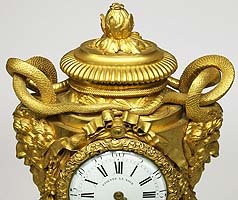 Under the signature Étienne Le Noir à Paris, Étienne Le Noir and his son Pierre-Étienne sold clocks and watches to distributors all over Europe. Their reputation was so great and their products in such high demand. 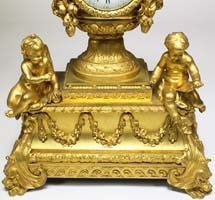 Étienne was born into a great dynasty of Parisian clockmakers; his family was first mentioned in the profession in the 1500s, and the firm established by his father continued to operate until the 1820s. The workshop's production reached its peak during the partnership between Étienne and his son.